Raven 502 is an aromatic-based, hybrid spray polyurea that is extremely user- friendly and can be used in a wide variety of applications including various OEM parts, secondary containment, pre-sprayed geo fabric, and many others. 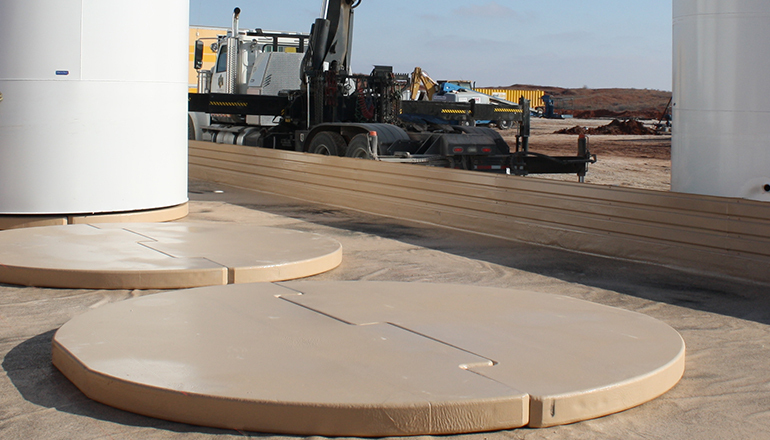 The picture above demonstrates the product being used as a coating for tank pads. This product displays 45 Shore D hardness and has fast “front end” cure speeds and geo fabric applications can immediately be rolled and readied for shipment. In addition, Raven 502 offers a three hour overcoat window for use in the field. The chemical resistance to most oilfield chemicals is excellent (check chemical resistance chart for specifics). Raven 502 offers three to four second gel time and is tack free in four to five seconds. Raven 502 can be applied in temperatures ranging from -20°F to 200°F. It can be applied in > 90% relative humidity conditions with minimal to no bubbling. Contact Raven for primer recommendations for various substrates.